A new journey of flavours has begun this September at TRACE Restaurant and Bar. With a gorgeous skyline view of the city stretch across the distance, dining at TRACE Restaurant and Bar at Element Kuala Lumpur is a delicious sensory dining experience not to be missed. Located on 40 floors, TRACE is spaciously designed to incorporate an element of modern contemporary dining with comfort. The name TRACE speaks for itself; the objective is to create transparency around what is in the food and where it came from. Committed to serving fresh and local produce in support of our local farmers, TRACE offers bold local and international flavours with a twist in their menu. Executive Chef Man and his culinary team takes on inspiration from Marriott International’s Go Local Concept and created his latest menu that offers more local dishes. With an open kitchen placed centrally around the main dining area, diners can catch whiffs of deliciousness as well as Chef Man’s culinary kitchen actions while dining at TRACE. The Kerabu Mangga Isi Ketam (RM23) is a crowd pleaser. Simply irresistible, this delicious concoction of sweet crab meat chunks with spicy and sour mango kerabu salad is a match made for each other. Lots of flavourful oomph of savory, sweet, spicy and sourness whets the appetite for more to come. The Live Well Salad (RM27) offers a healthy and tasty salad with a light dressing. Lots of fruity notes from the beetroot, orange segments, berries and crisp salad greens that makes this salad so fresh and delightful to enjoy. For a single light meal, the Wrap & Roll Sharwarma (RM32) is your best bet. Thin sliced roasted chicken breast with light salad greens, cucumber and onion served with sides of Tzatziki sauce and special sauce along with thick cut fries is great for any time of the day. The classic Malaysian oxtail soup (RM38) is beautifully cooked and presented. Served with crispy toast, lime and kicap sauce, these condiments are perfect with the rich and robust spiced up soup filled with tender chunks of oxtail. Finished with fresh coriander and fried shallots for that aroma, the soup is hearty and tummy warming. TRACE's signature pizza (RM40) is slathered with local flavours. Thin and crispy crust, blanket with organic tomato sauce before being topped with spicy chicken, chicken floss, thinly sliced onions, cheese and lime wedges, the pizza is deliciously tasty. 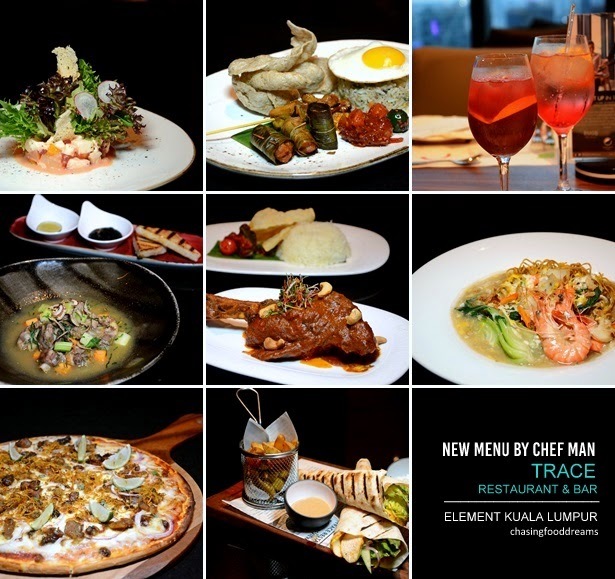 If there is one dish to call it Chef Man’s signature, it would have to be Rempah Kuzi Kambing (RM58). A recipe from his Great Grandmother with different spices from India, Arab and Malaysia, the braised lamb shank is served with ghee rice and crispy pappadum. The lamb flavours are decadently rich with bold spices cooked into thick tomatoey sauce finished with cashew nuts. Its fork-tender and has soaked up all the deliciousness of the sauce as well as the wonderful aroma. Certainly, a dish not to be miss! Crispy Yee Mee noodles drenched in silky egg laced gravy, crowned with large prawns with chicken, fishcake and greens, it’s a jazzed up comfort dish that is much enjoyed by many daily. The flavours of Egg Noodles "Yee Mee Kung Fu" (RM32) are well-balanced, with hints of savory sweetness pairing so well with the egg noodles and sweet fresh prawns. Besides the above, there’s also Mee curry laksa (RM32), Mee mamak (RM32) and Nasi Goreng Kampung (RM32). The Nasi Goreng Kampung is a lovely sight. Fried rice ala kampung style is accompanied by satay skewer, little bundles of pandan chicken, fried egg, crunchy ikan keropok and fruit chutney sambal. A little mini buffet of flavours to jazz up the fried rice. Other international dishes to try includes Lamb Chop with potato au gratin (RM72 for 350g), Salmon fillet with saffron cream sauce (RM69 for 200g), Australian tenderloin with truffle mash and balsamic black pepper sauce (RM120 for 200g), Corn-fed chicken with spinach a la creme (RM51) and more. Our tasting platter of all four dishes is impeccably cooked and presented well. The lamb was superb and succulent and so was the tenderloin. The chicken roulade is moist and served on creamed soft spinach while the pretty pastel saffron creamy sauce complimented the salmon deliciously. Desserts are not to be missed as there are quite a few choices of familiar classic desserts such as Cheese Cake (RM30), Pandan Tiramisu (RM28), Bread pudding (RM28) or Dark Chocolate Volcano Lava Cake (RM36). Whichever dessert one chooses, it will surely leave a lasting sweet note while dining at TRACE! If not taken with sugar, the alkaline nature of green tea helps to reduce the blood glucose level. Moreover, the antioxidant and astringent qualities of Slimming Tea ensure good health and better functioning of the pancreas.